Have you ever stepped back and thought about how concieted are are sometimes? It seems like the one thing that everyone is so sure about is that God loves us. We are sure of it. We are so sure that we even teach our kids songs about it. "Jesus loves me this I know, for the Bible tells me so." What Bible verse does everyone know?? John 3:16 --"for God so loved the world . . . " Somehow we are well secure in the fact that God loves us and why wouldn't he?? I know I'M a very lovable person!! And there is nothing wrong with that. God does love us. We SHOULD feel secure in his love and when everything is in doubt we have that---God loves us. We SHOULD rejoice and be glad because God DOES love us and he DOES want a personal relationship with each and everyone of us. God DOES love the world so much that he sent his only son so that we may have life in him. Ready for the scary part though? Nothing in Christianity is easy afterall. Think about how much we think God loves us . . . and realize that we are supposed to love everyone else just like Jesus loves us. Crud! That's difficult because--I tell you what . . . there are a lot of people that I just plain don't like!! And I'm supposed to love THEM just like Jesus loves ME?!?!? CRUD! But it's right there. 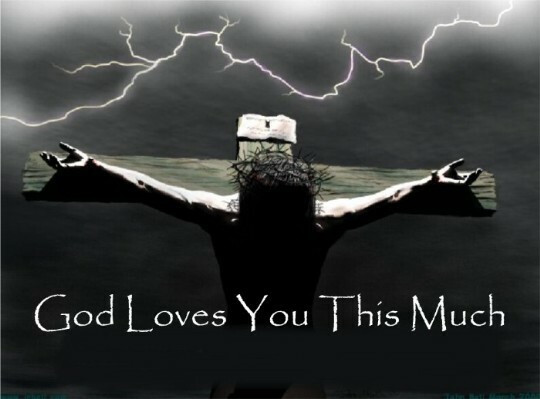 Just like I know Jesus loves me because the "Bible tells me so" I know I am supposed to love you just like Jesus loves me. It's right there in black and white. It's in this weekend's reading--John 13---"As I have loved you, so you also should love one another." Let that sink in for just a moment. That Christian love is what is SUPPOSED to make Christians different. That is how Christians have been identified since ancient days. It's one way that Christianity was spread because people could see God's love in the way that Christians loved and treated others. Jesus also tells us that we will be identifed by the love we have for one another. If we do that, we can be like Paul and Barnabas did in the first reading . . . just going town to town evangilizing--letting people know us by the love we have for another.